Cabernet Sauvignon by Penley Estate of Coonawarra. The palate is rich with sweet berry flavours, controlled oak and grape tannins, to balance and meld with the solid weight of fruit. This enduring flagship wine can boast twenty trophys and over seventy gold medals throughout its illustrious history. Ten blocks of Cabernet Sauvignon are grown at Penley, the best from each block will make it into the final cut, to construct a complex, traditional style of Coonawarra Cabernet. The key elements are its rich varietal flavours and choice of oak, finely tuned acid and judicious astringency. The mission of Penley Estate and Kym Tolley is to produce a selection of wines with an emphasis on quality of product as well as the skill, enthusiasm and artistry of the team of people involved in the wine making process. Kym has always had wine in his blood, he is a direct descendant of two of Australia's most famous winemaking families, the Penfolds and the Tolleys. Twenty five years is a long time to be in the same profession but ask Kym Tolley what he would do if he was not a winemaker and the answer is simple. "I've not been able to think of anything else I'd prefer to do," he said. "Winemaking satisfies all my creative urges along with my need for discipline. To me, it's simply fantastic to be able to make a life out of being creative." Directly related to two of Australia's pioneer wine families, the Penfolds and the Tolleys, Kym continues to mix the best of traditional and modern winemaking methods at Penley Estate. Born in 1953, Kym Tolley was educated at St Peters' College Adelaide. 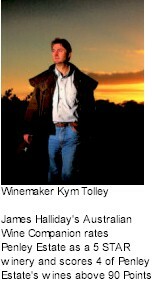 He completed his diploma in wine production at Roseworthy College in 1977. He remained with the company until 1988 when he left to establish Penley Estate. For Kym, Penley Estate is a dream come true. His vision was to develop a solid business which would allow perpetuity and future growth for his family, while providing the opportunity for him to continue to create interesting and quality wines. Father to Hannah, Lachlan and Madeline, Kym often quotes an historic quote of Australian wine writer James Busby who in 1830 said: "A man who could sit under the shade of his own vine with his wife and his children about him and the ripe clusters hanging within their reach in such a climate as this and not feel the highest enjoyment, is incapable of happiness"
Throughout the years that Penley Estate has been producing premium quality wines, the winery has enjoyed an extremely successful wine show and review record. Penley's Trophy record alone, if averaged out over the years averages out at approximately 4 per annum, an impressive feat.